TGIF! It’s Friday!! Wooooo! Do you have big plans for this weekend? I have a pretty busy weekend planned. Soccer practice, ballet, furniture shopping, painting the master bedroom, and taking my daughters to a play. Wow when I type it all out it seems like there is a lot going on. Like I said we are painting our bedroom this weekend. We have been in our house for 3 1/2 years now and it is time for the purple to go! I will take some before shots to share with you. We have dark purple walls, dark purple carpet, dark wooden blinds, and yellow-gold closet doors. It is too dark in there. We are planning on painting the walls white, ripping up the carpet (there are hardwood floors under there! ), and getting new blinds. It shall be a fun and cheap makeover. Ok. Now on to the Chunky Dip. The only reason I am calling it chunky dip is because a long time friend gave it that name. So I am honoring him by calling it that. 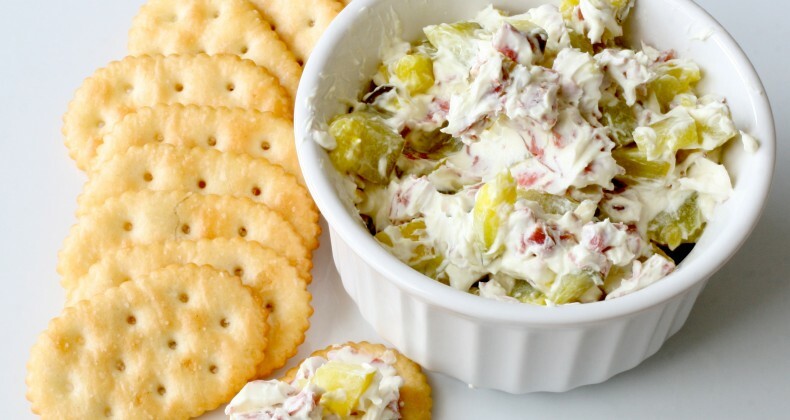 You can call it pickle dip if you’d like. Have you ever had those pickle wraps? 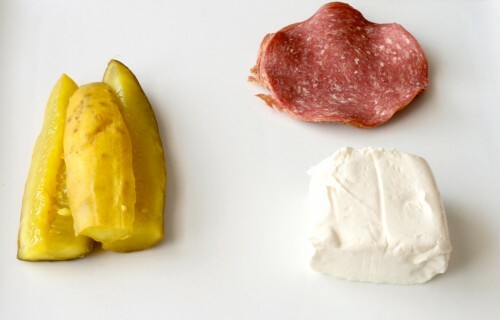 You know the dried beef or ham smeared in cream cheese and wrapped around a pickle then sliced into little pickle wrap coins? It is delicious. It is one of my favorite appetizers from my childhood. Grandma Bonnie would sometimes make them. Every time I have tried to make them I usually end up ripping the dried beef or ham when I try to spread the cream cheese on top. This dip invention saves me the trouble. Chop everything up, add it to the cream cheese, mix it together, then serve on crackers. Easy peasy! Whip up a batch to serve at your Super Bowl party! The ingredients shown are for a half recipe. I didn’t want to have a ton on hand.Â It was suggested that instead of chopping up dill pickle spears use dill pickle relish instead. I think that is a great idea! Chop up the pickles and dried beef. Stir into the softened cream cheese. Serve immediately or refrigerate until use. Allow to soften 10 minutes before serving. This will make it easier to spread on a cracker. Enjoy! Thanks for the linkup with my Coconut Oil Cookies. I love those things and hope you get a chance to try them! I really want to dye my hair an unnatural color. Is 29 too old to make such a drastic change? <– go for it! Where I live, it's extremely common! Chunky Dip! I hope this inspires a generation. Also, Kimmy and I have had a mini dachshund for a few years (though she’s currently staying with a friend in Colorado). And Kimmy wants to die her hair funky colors.